Trees abused by misguided pruning efforts or trees damaged in storms or cold can recover. 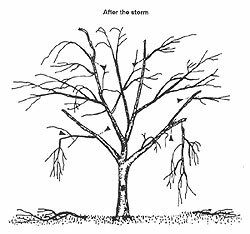 The extent of recovery depends on 1) species characteristics including the ability of the tree to compartmentalize decay (See: list of trees), 2) extent and location of damage, and 3) the skill of the arborist attempting restoration. The arborist cannot affect the first two items. This page deals with the third item, i.e. the techniques used in restoration efforts. Restoring a tree to a sustainable structure following damage is time consuming, takes a number of prunings over a period of years, and is difficult to teach to others. It is difficult to actually restore a tree to its previous condition; restoration does more to improve structure than it does to restore it.